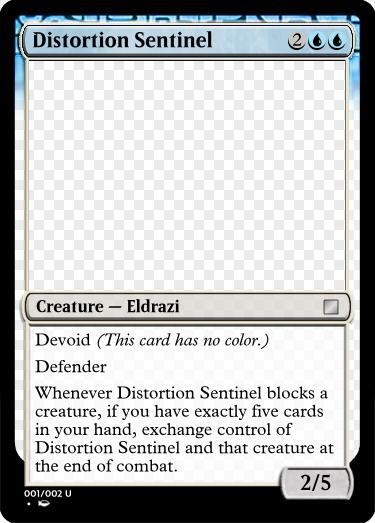 First, and foremost, Eldrazi are not common. They have no business in that rarity. Next, no square stats. They should primarily be pure colorless, but if colored, in blue and green, and on occasion red or black. They should not be White. I'm cool with devoid as a marker now that its damage has been done. They should never have square stats, and when it doesn't impede on reasonable gameplay, their mana costs should be ones we see less frequently. Finally, they should not have rules text that we see with any degree of regularity on other magic cards. Eldrazi should always feel weird. They should care about casting cards instead of resolving them. They should feel powerful, but not in a "bash you in the face" kind of way. I don't like that combat timing requires us to delay the trigger, since that raises some significant rules issues (no exchange if both creatures aren't still OTB, hand size check at both trigger and resolution, or just on trigger?). I like the handsize check since it leads to a lot of bluffing opportunities when you have mana up. 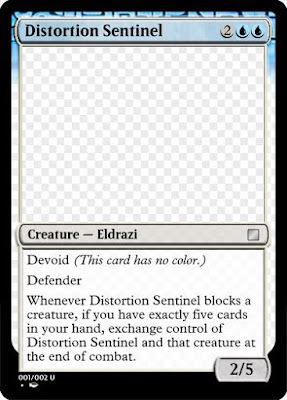 This could definitely use some templating tweaks, and might need to be bumped to rare simply for the rules knowledge it would require, but it's a card I'm comfortable calling an Eldrazi. That's definitely weird! I have yet to attempt to design an eldrazi. I find an entire race that exists for the expressed purpose to be gimmicky rather challenging. I think being a combo player actually makes it worse, because I want to design it to appear gimmicky but actually fit in some type of play style that already exists. "At the end of combat, if you have exactly five cards in your hand, exchange control of Distortion Sentinel and a creature it blocked." Nice templating fix. I like it. I wanted you to be able to use card draw as a combat trick, but I think this works just as well. Seconded Larcent. I think that's a clean, clear, and under control template. It also would work better for online triggers as well. It won't bother triggering if the sentinel dies, for example. When you cast ~, exile a card from the top of each players deck face down. At the beginning of your upkeep, exile the top card of target players library. 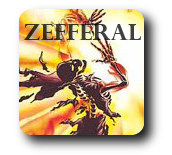 Sacrifice an Eldrazi: You may play cards exiled with ~ this turn. I'm super tired a just realized how sad of a design that was. I could bump up the numbers (boring) or give it a way to fuel itself (a little better) so it should probably add 'whenever you cast an Eldrazi spell, create two 0/1 Eldrazi spawn creature tokens". So thinking about the Distortion Sentinel's ability a little bit more (I had insomnia last night) I do ended up wondering about its actual usefulness. If you want to use its special ability, you need to block a creature that won't kill it. So ultimately you'll be trading it for a creature that's capable of being blocked by it and surviving. Or is that maybe the point? You need to find some other way to use that stolen creature besides attacking with it. Perhaps there's some sort of blue-black defensive control deck that operates off sacrifices. It's a very niche Jenny card, I think. There may be a good way to exploit it. Spike may appreciate it for the bluffing potential it creates, but probably not. I think the five-card restriction is an instant dealbreaker for Spike.